Thale - Harz Mountain Town. Hikers and Witches! Only 10 km from Quedlinburg lies the little village of Thale in a strikingly beautiful river gorge. 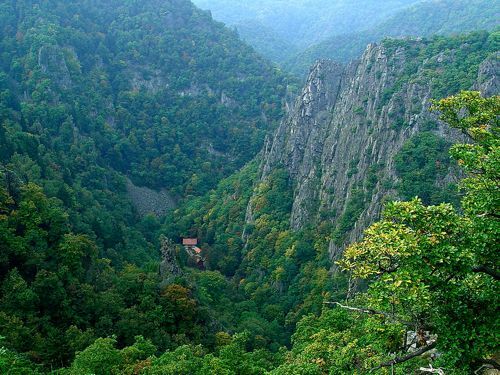 Once a center for pagan Germanic worship, it is now a great area for hiking and relaxation. The Bode River cuts through the Harz mountains and just outside Thale it flows through a spectacular series of rapids and clear pools. This is another area much-loved by Germany's poets. Goethe, Heine, Herder, Klopstock and Fontane all walked along these paths and it inspired some of their writings. There are miles of wonderful hiking trails starting from the town. Just a couple of blocks away is the Bode River. Thale is a very small town and it is easy to find your way around. There is probably nothing in the town more than seven blocks from the train station. See the map of Thale at the bottom of the page. Just past the little train station and behind it is the Tourist Information Office. This is a good place to stop first to make hotel reservations, get maps of the town and hiking trails and pick up brochures about local sights and events. The woman in the office was very friendly (and spoke English). She told me her son was hiking in Yosemite that summer. Small world! 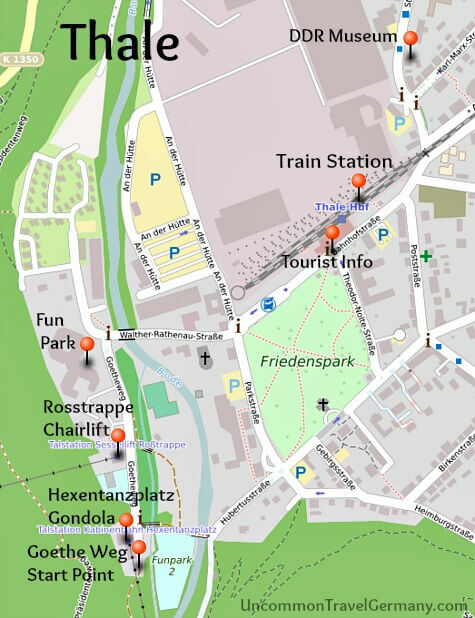 Just about all the activities in Thale start from a park area just over the bridge west of the Tourist Office and train station (see map below). Here are the starting points of the gondola to the Hexentanzplatz on the top of one mountain and the chair lift to the Rosstrappe on top of the other one. There is also a miniature golf course, a little amusement park for children (Funpark) and a restaurant (basic-if you really need to eat. There are much more interesting ones elsewhere). The prettiest hiking trail leaves from here also. The walk along the Bode River is truly delightful. The trail starts just past the gondola terminal and the miniature golf course and is well-marked (named Goetheweg since he walked along here as well). The first part is very easy. The path goes right next to the rushing stream, with wooden benches placed at intervals in case you want to sit and admire the view. Just before the Jungfernbrücke (a pretty stone bridge over the river) there is a rustic lodge and little outdoor beer garden at the Gasthaus Königsruhe. There are tables placed right next to the river; it makes a great spot to stop for lunch. They make their own bread and wurst and serve trout from the river. In addition to beer and soft drinks, they served a long list of wines made from berries. Without a German dictionary, I picked one of the wines at random. Delicious and refreshing, not too sweet. It was very pleasant to sit in the shade on a warm day sipping berry wine and listening to the music of the water! If you continue on the trail, you will come to another bridge, the Teufelsbruecke (Devil's Bridge). At that point another path splits off on the right; it climbs all the way to the Rosstrappe. If you stay on the original path, it continues along the river and starts to climb until you are looking down on the pools and rapids of the river from high up the side of a cliff. Eventually it levels out and takes you to the village of Treseburg. From there you can take a shuttle bus back to Thale. See maps and description of the Hike to Treseburg. This is the name one of the two mountains looming over Thale. During pre-Christian times, this was an important site for the secret pagan ceremonies, first the Celts and later the Germanic tribes. Legend had it that this was where the witches gathered before their flight to the Brocken on Walpurgisnacht immortalized by Goethe in Faust. The Hexentanzplatz is the site of a huge celebration every year on April 30, Walpurgisnacht. Over 30,000 revelers show up. 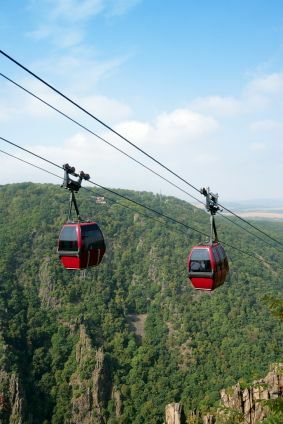 You can get up to the Hexentanzplatz by car, by foot, or you can ride up on the gondola (amazing views, recommended). The gondola leaves from the park on the edge of town (see map below) and takes you to the top of the mountain; you get a great overview of the valley and river. There is an open air theater cut into the side of the mountain where performances are given during the summer months. The Walpurgishalle has an exhibit about the legends of Walpurgisnacht (named after an English saint who lived in the area, Saint Walburga, who was believed to guard against evil spirits). Interesting item on display: a stone used for human sacrifices in pagan ceremonies. 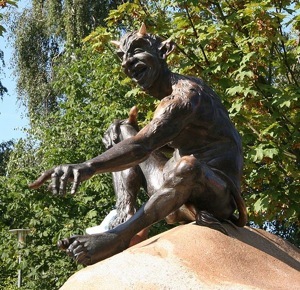 There are some unusual statues of devils, gnomes and witches scattered around the area. The top of the mountain is flat; a short walk takes you to a little zoo in a natural setting. The most interesting exhibit at the zoo was a wooded area with wolves. A walkway crossed over it and it was rather eerie to stand looking down at the wolves roaming among the trees. The raccoon exhibit seemed a bit odd to me, since I have them in my back yard every night. The Germans call them "wash bears"; a better name than ours, I think! Going to a zoo to see a raccoon is somewhat like going to see a pigeon, but then raccoons are not native to Germany. They are becoming a major problem in Germany. Apparently a colony of raccoons in captivity escaped during the chaos of the last months of the war and have made themselves at home in the forests, disrupting local fauna. Back down in the park, you can take the chair lift up to the other mountain, The Rosstrappe. 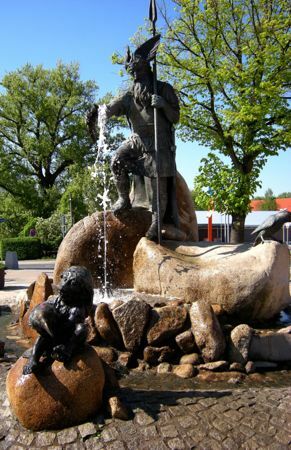 According to legend, the princess Brunhilde was escaping a forced marriage to an amorous giant, Bodo. 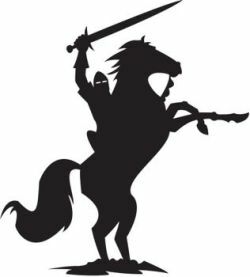 Her horse took off from the Hexentanzplatz and leaped across the gorge to the Rosstrappe. Bodo, however, got what was coming to him. His horse didn't make it and he plunged into the valley below. His ghost, in the form of a dog, is condemned to spend eternity guarding the golden crown that fell off Brunhilde's head into the river during the chase. The hoof print her horse made on landing is imprinted in a rock which can be seen on the mountain top. Another great spot for a view. To read the whole story, go to Legend of the Rosstrappe. The park at the edge of town where everything begins also has a Funpark with quite a variety of rides and activities, including trains, rockets, bumper cars, trampolines, water slides, bungees and a funhouse. Up on the Hexentanzplatz there is a mechanical version of a bobsled called Harzbob. The sleds went zooming down a track at high speeds. I didn't try it, but it looked like fun. Both adults and kids were riding on it. The lifts and Harzbob are open year round; the Funpark is closed in winter. Just west of Thale is another small town, Rubeland, with large, ancient caves. Inside are impressive stalactites; the caves were inhabited by cave bears and later humans during the Stone Age. There is a bus from Thale to Rubeland. Goethe and Heinrich Heine were visitors here. For such a small town, there are a lot of hotels and pensions. I stayed at a comfortable pension, Am Steinbach, at Poststrasse 9, conveniently located two blocks from the Tourist Information Office. The owners were very friendly and welcoming. They had just returned from living in Mexico and liked to travel. There were photos of Yosemite on the walls in the hallway (small world again). The hotel was clean, quiet and reasonably priced (Euro 36 and up) and included a nice breakfast. I noticed two other hotels that also looked appealing. Both were right on the river in the woods along the Goethe trail; a little more out of the way but in a very pretty setting. 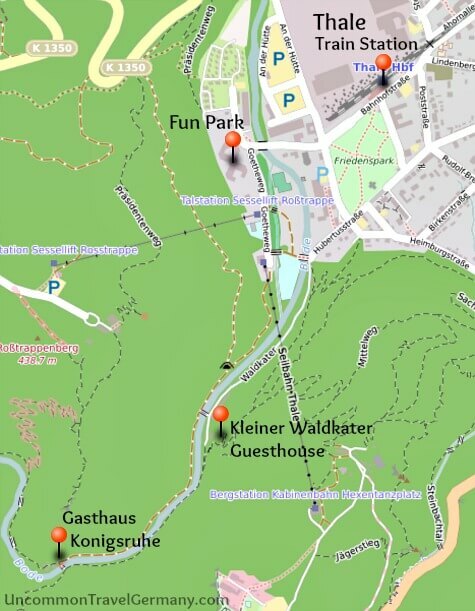 The first Gasthaus is just across the first footbridge, Katenstieg, and is named the Kleine Waldkater. It is tucked into the woods and has an access road behind it. The website is in German, but you can see photos of the hotel and dining room: www.kleiner-waldkater.de E-mail: info@kleiner-waldkater.de. The next hotel is the one with the berry wine: Gasthaus Koenigsruhe. It is a bit further along the trail at the Jungfern bridge. Their rooms are reasonably priced and they also have holiday cabins with kitchens. This hotel was named King's Rest because the King of Prussia rested in a hut on that spot in 1834. 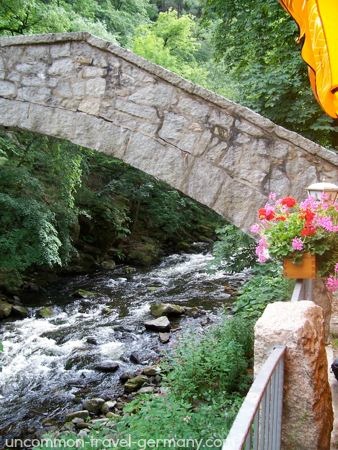 The hotel is a collection of charmingly rustic wooden buildings just next to the Bode River. You can eat outdoors by the stream or inside in a cosy, old-fashioned dining room. For more info, check their website: www.koenigsruhe.de (in German, with photos). They will bring your luggage to the Gasthaus for you from a parking lot in town. From Quedlinburg, the HarzElbeExpress train goes directly to Thale in 12 min. From Wernigerode you can take the train (change in Halberstadt) or a direct bus to Thale; either way takes about one hour. Halberstadt is on a main line that connects with routes to major cities. The train from Goslar goes by way of Halberstadt also. 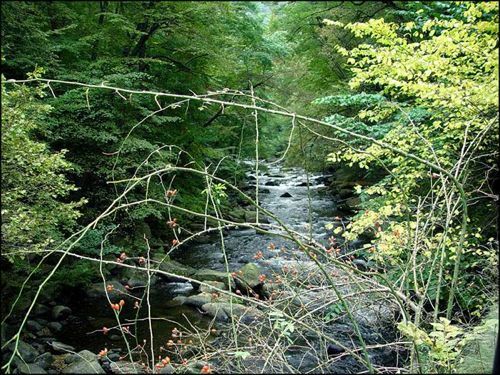 For how to get to the Harz area and maps of the Harz, see travel to the Harz.